Delight in one of the most popular condiments with these French's Classic 7 gram yellow mustard packets. A brand you can trust, French's yellow mustard is all natural, without calories, fat, or artificial flavors. You can't go wrong offering the tasty topping at your concession stand, cafeteria, or cafe. The slightly tangy, unique blend of savory spices, mustard seed, turmeric, and other flavorings has made mustard a favorite among customers of all ages. French's is my personal favorite mustard brand. I really like the taste of french's on corn dogs. The packet makes it easy to apply to corn dogs as you eat it. This perfect-sized packet is great for orders in-store or to-go. It helps to cut down on waste and mess and is therefore economical. And, the Frenche's brand tells folks their getting quality. We have been buying the mustard packets for various cookouts here at the dealership. Much more convenient than bottles. Great price and fast shipping! We now keep them in our break room for employees to use as well. This is a great product, same taste as the regular french's mustard as expected except in a small to go packet for take out order. customer loves it. This is a great mustard packet but it is priced a little high. The plus shipping helps but should be on all items. Customers like the taste. How could you go wrong with French’s mustard and the convenience and price of these? No refilling bottles of mustard and such. Saves me so much time! These are great and the packaging kept the product safe and secure during shipping. It arrived on time and was an overall great experience we will order more. Exactly what you’d expect from drenches mustard. Very handy for my food truck and they work out better than using pump bottles and a lot cleaner. Easy to use packets! Our guests love Frenches over any other mustard. It comes in a convenient package and is great to have for to go orders! It's mustard :) It did its job being mustard. French's is our classic choice when it comes to needing packets of mustard. its a Great Product. When making a classic hot dog , A quality sub sandwich or a Carolina BBQ nothing beats French's. It is a taste I have not outgrown. A tasty French's classic yellow mustard portion packet. A nice way to top hot dogs and the single portion packets are great for putting in to go bags. What this wonderful product does to a burger, sandwich, or brat is unrivaled. Been using French’s since I can remember. It has a great flavor. Everyone knows and trusts the french's brand. This is the only brand that we have every used in our kitchens. Thank you for shipping everything out so quickly. 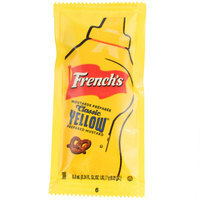 Our school concession stand only uses these mustard packets from French's. The taste is tangy and perfect and the price is great. A nice high quality mustard for hot dogs, fries, and so much more. Nothing against the other brands of yellow mustard sold but this is the best in my opinion. I grew up using this product and now use it as an adult in my restaurants and mobile food trucks. French’s Classic yellow mustard 7 gram packets! Portion size packets for daily use. Easy to open and just the right amount. Great for trips and picnics! Nothing beats frenchs mustard. I love the tanginess and strong mustard flavor it has without being overpowering. I just ate this mustard on a sandwich and it was the perfect addition. The French's classic yellow mustard is wonderful and so iconic. The portion packets are perfect for picnics and bbq and goes great on burger and hotdogs. Great little packs of the famous brand national mustard. It comes in at a fraction of the price of usual suppliers! Love this pack size! You gotta love French's mustard on hotdogs. These are great for offering a great name name brand and high quality taste at a price and quality you will love. These mustard packs were perfect for a fit into our sandwich boxes for a catering order. The quality of taste in the individual packet was just as good as the mustard in our squeeze bottle. The cost is reasonable for what was received. We would recommend this product. Hands down the best mustard on the market. The portion control packets are awesome for the condiment station on our hot dog carts and easy for customers to help themselves. If I order a corn dog or a hot dog and french's mustard is brought out with it the meal automatically goes up 10 points in my book. I love it! Nothing goes better with corn dogs or hot dogs than this mustard. It's got a great flavor and these squeeze packs are very convenient for on the go eating. Who doesn't love frenchs mustard? It is such a classic. It has a great flavor but it doesn't have the same burning effect that other brands have. Must buy! French's Yellow Mustard truly is a classic. These packets are the perfect, convenient portion to put out for summer bbq's or easy customer grab and go use. The price is great! Frenchs mustard has an amazing flavor. It's nice and tart but doesn't burn. This packet is the perfect portion to have next to a hotdog or hamburger order. Great tasting mustard. Nice to just have packets to toss in a to go box or when you just need a littke bit and dont want a giant bottle. Hard to beat the classic. It's a little pricier than the Piknik brand so we may try it next but a case seems to last us a while. French's yellow mustard is one of the best brand mustards. These packets are very convenient and easy to use, instead of worrying about portion cups. French's mustard is one of the best tasting mustard's on the market. You couldn't go wrong with this product or the price even if you wanted to. It's great for portion control or to take to work or school. Good value for name brand mustard, perfect for our take out orders. No issues with the packets, none arrived torn, would order again and would recommend. The classic taste of French's yellow mustard, in convenient packets. If looking to impress customers, going with name brand products is the way to go. French's classic yellow mustard is by far the best tasting of all the yellow mustards in my opinion. Packets are convenient to use and carry. Perfect for what we were needing, has great flavor and was all in good condition. Excellent customer service and very fast shipping, we will be ordering more soon. Classic yellow mustard from French's in easy, single serving packets. These are great to toss in with a turkey or chicken sandwich to go. When you need a classic yellow mustard, don't settle for other brands, go with French's. Yellow mustard in easy to go packets. We use these daily in our food truck. They taste great and the large box they came in lasts or quite awhile. I will be reordering. Nothing bad to say about this - everybody loves French's Mustard! It is a great price for a much needed product in any deli or sandwich shop. We use only the best and Web offered this mustard at a super low price, the customers love that we use name brand items, on some items there is just no substitute. We purchased the French's Classic Yellow Mustard individual packets for a staff gathering. They were convenient, and worked very well for our purposes. They came sturdily packaged and in good shape. We would recommend them. Just what my sandwich "box lunches" call for. No damage, on time, easy order, packaged with other products ordered at same time to save shipping costs. Very satisfied.